Our main target is to have 50 secondary students from 10 different schools in the FCT from both Public and Private School with 60% female attendance (To promote Girl Child Education) in one building to code and build solid web and mobile application during the period. Each school will have the opportunity of sending their 5 best Computer students with 3 girls and 2 boys to focus and encourage more girls/female to code. 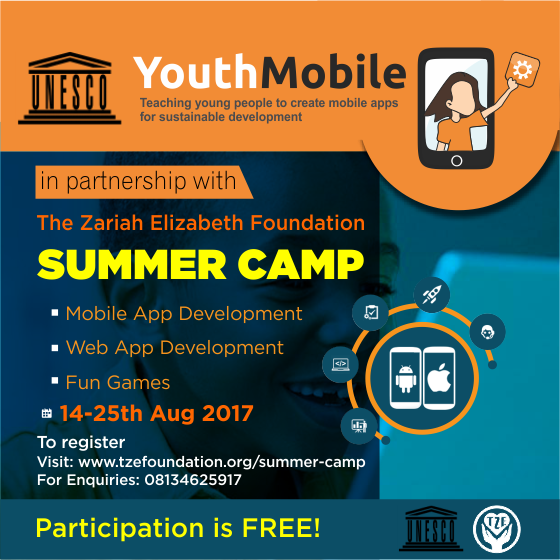 During the summer camp we will expose the kids to fun and mind games to aid their ability to creatively solve problem. Our tutors are drawn from experienced software developers with the willingness to teach and share their knowledge with the future generation of software developers. In the course of the training facilitators, Mentors and trainers will share their experiences on how they got started as developers, their challenges and how they were able to excel. Click on the Button to take the Web Application Quiz. Click on the Button to take the Mobile App Quiz.